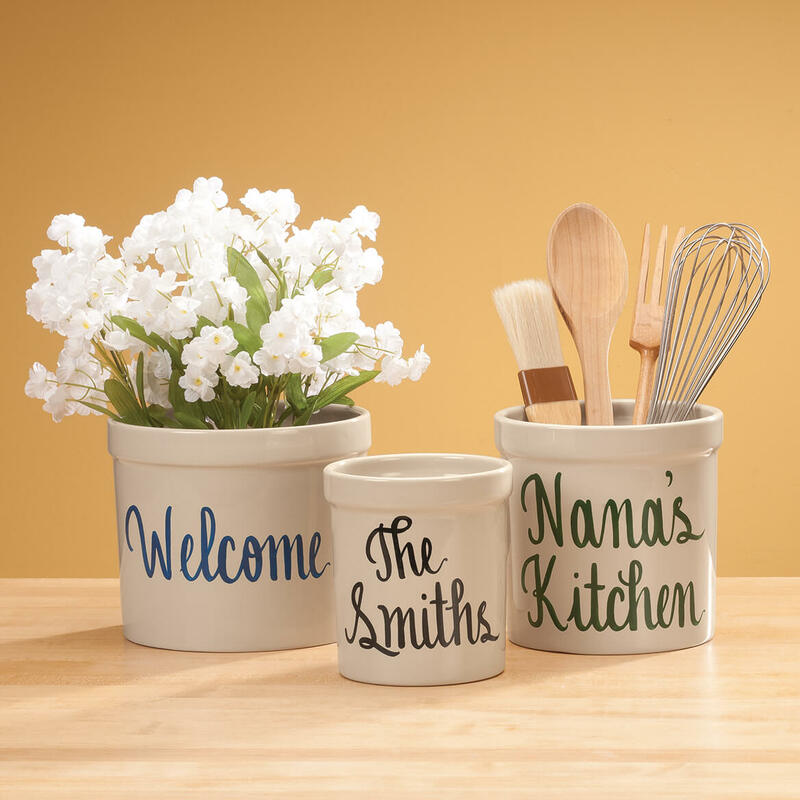 Personalized Stoneware Crock - 1 Qt. I ordered this as a gift for my daughter-in-law. It was in perfect condition and I'm sure Lisa will love it when I am able to deliver it to her. I'm very pleased with the item. I use this to hold scrub brushes by the kitchen sink. Perfect size, and won't tip over. Plus, it looks lovely! Debated this purchase for years because of the price--now I am sorry I procrastinated for so long! This beauty sits on my counter top, holding my stainless steel utensils that are weighty and would fall over in a plastic container. Keeps everything at a finger's reach, I like that. Cute, stately and a conversation starter. I bought this for a Christmas and housewarming gift. Very nice. My Husband wants me to buy one for myself. 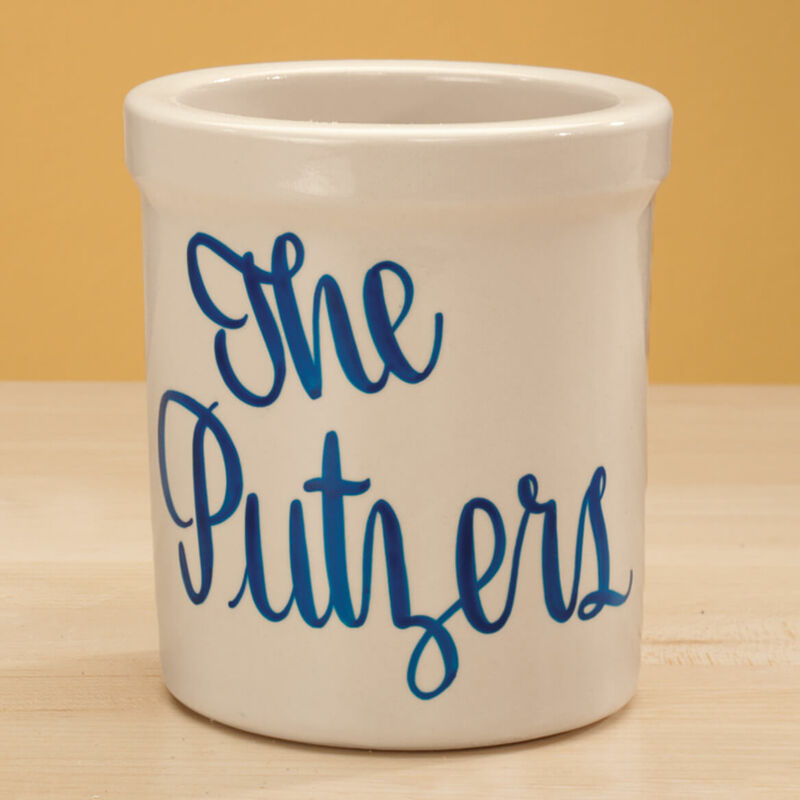 Great personalized gift that will please. This is beautiful stoneware, holds lots of utensils next to the stove, is an incredible value for the money, would make a great personalized gift, and it's very versatile to use anywhere in the home. Expert lettering too! I can't say enough about how happy I am with this purchase! I bought one of these for my new kitchen and I love it. Several people saw it and ask me where I got it. So I ended up buying 6 of these for Christmas Presents for family and friends this year. They loved them. silverware and put a plant in the other one to have on the table. They will be used often I am sure. Best anniversary present I ever gave. I have ordered 7 of these Crocks and 6 were given as gifts. Everyone LOVES them!! Conversation piece, and great utensil storage which can sit next to the stove. 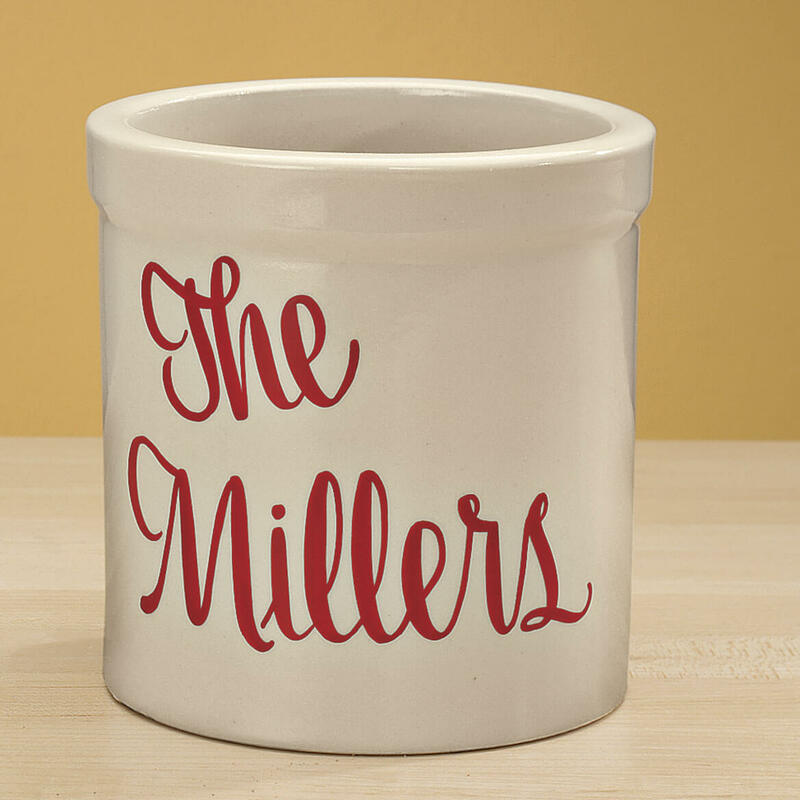 I love this personalized crock! I buy this year after year for teacher's gifts, wedding/bridal shower presents and of course one for myself! I love to put a small poinsettia in it for the teachers or I'll fill it with utensils from bridal registries and they are reasonably priced. Everyone always ooohs and ahhhhs over it and I look like the most thoughtful person in the world! Plus, who doesn't like to see their name on something?! 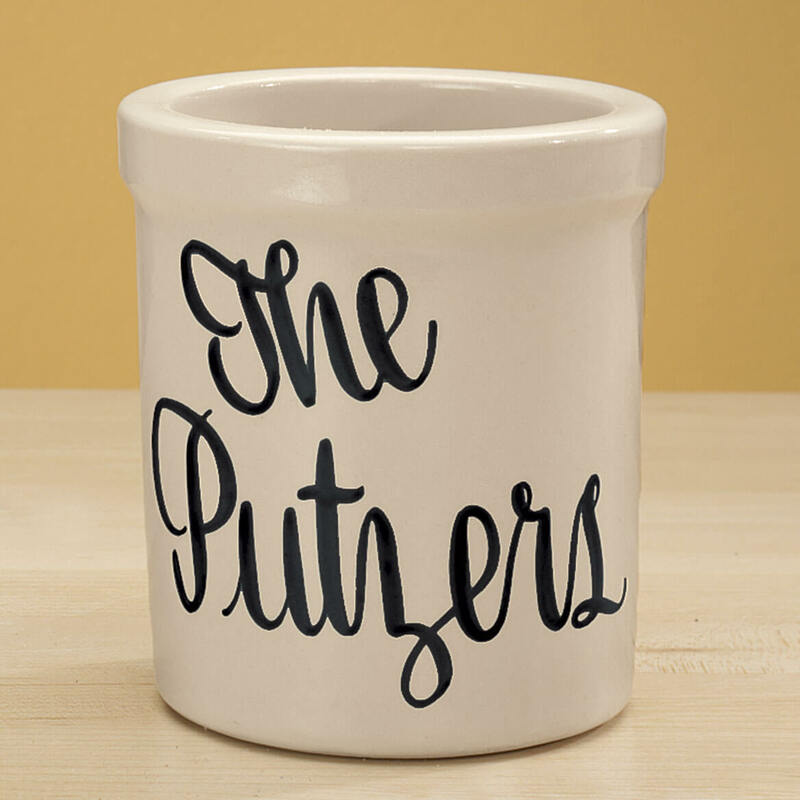 i give this gift to every bridal shower i am invited to. it's very personal and useful to. the brides and grooms love them. Wonderful addition go the kitchen. Gave as a housewarming gift. It was loved. Very personal. What a lovely gift, personalized! This is a lovely gift to give someone. It's very sturdy and would be able to hold quite a few things. It's very fashionable. It could be used outside with a plant in it. Best of all, it's personalized! I Loved giving this as a gift to my friends so much that I had to have a set for myself! Perfect for gadgets holder. Great use for anything really. Replaced something I had for 30 years that wasn't nearly as perfect. 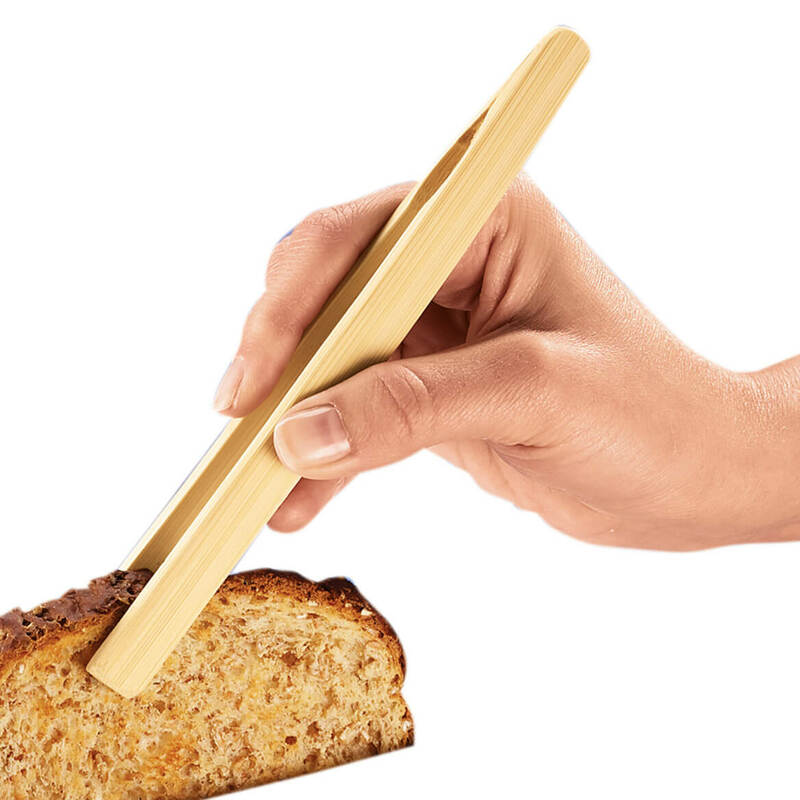 I use it in my kitchen for all my utensils. 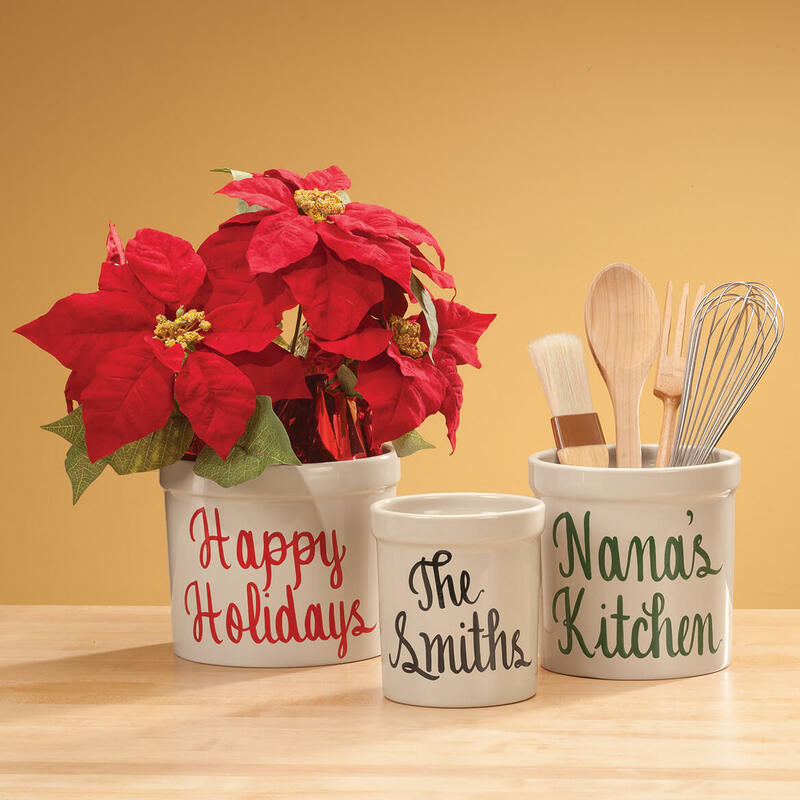 So far I have purchased 4 of these Personalized Stoneware Crocks, 1 for myself & 3 as gifts. Crocks are good quality. I will definitely order again and again. It's in the Kitchen with wooden spoons. Very nice quality I'm happy with the red color letters I chose. I have bought this for many friends and they all love it! Very nice look in my country kitchen. 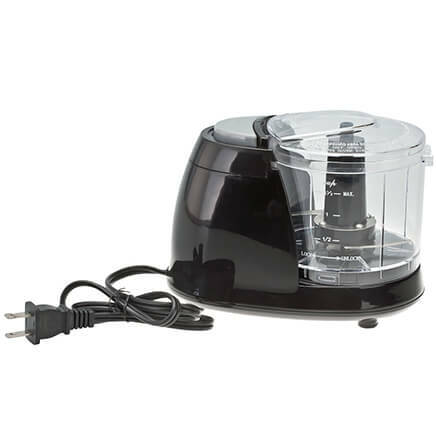 This is small so it takes up minimal counter space, but holds a lot of bulky utensils such as spatulas, wood spoons, potato masher, etc. The writing on the front is very attractive and professionally done. 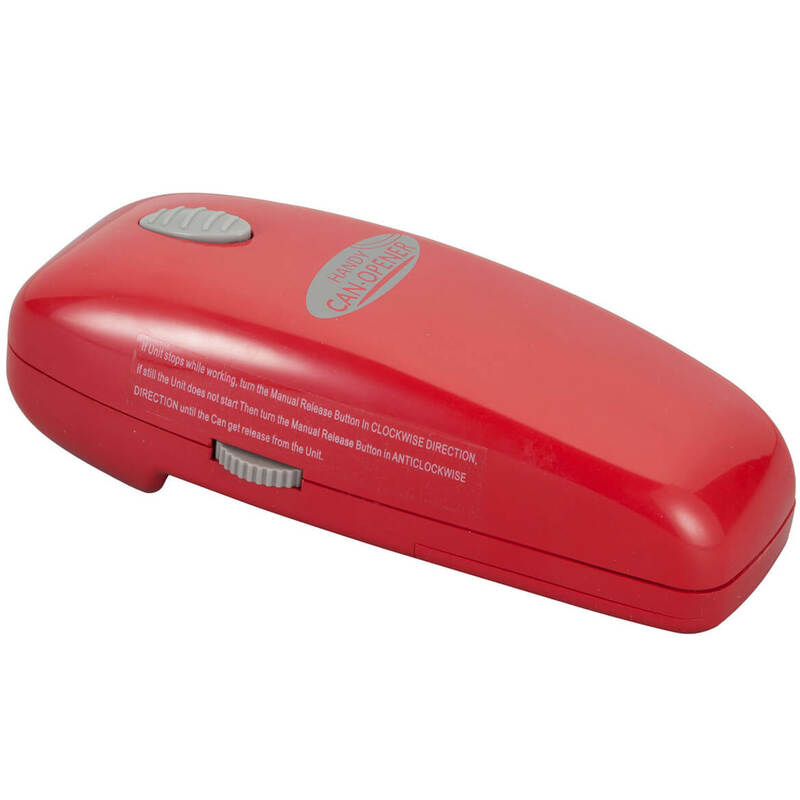 The personalization makes them great to give as gifts. 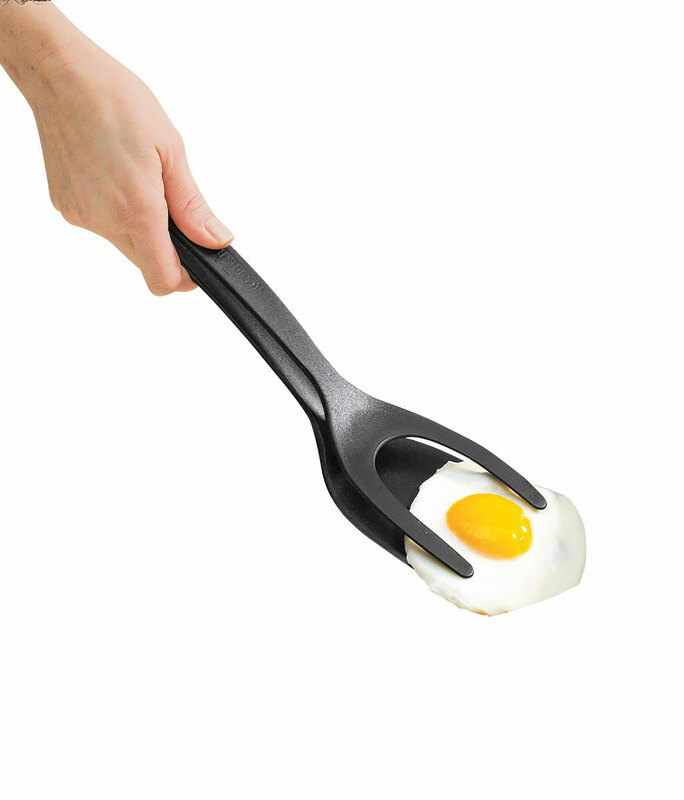 Use this to hold larger spoons and spatulas. Convenient access when cooking. Excellant addition to her kitchen !! This is a gift but I would buy it for myself anytime. It arrived very fast and it is very good quality. I will order the larger sizes as soon as available! I love these crocks!! Really wanted the larger ones but these smaller ones are great! My daughters will love them!! A nice personalized gift for a friend. I have purchased several of these as gifts for friends. They have all been very pleased to receive such a nice personalized gift. And it is useful too! Bought this personalized in green for my daughter- in-law, she loved it! She has a small kitchen and plans to use it to hold her kitchen utensils. I liked it so well that I may have to order one for myself. This was a gift for a friend's new kitchen. He was thrilled with it. The lettering was very well done, and the colors are deep. It's just the right size for keeping several utensils handy by the stove. I ORDERED THIS FOR MY DAUGHTER-IN-LAW AND SNCE I DID NOT RECEIVE IT IN TIME FOR XMAS, SHE HAS NOT GOTTEN IT AS YET. SHE'LL GET IT SOON AND I'M SURE SHE WILL LOVE IT AS I DO. I THINK IT IS TRULY LOVELY AND I AM PROUD TO GIVE IT AS A PERSONALIZED GIFT. I have been looking for something like this for quite a while. It is the perfect size and looks very attractive on my kitchen counter. It would make a great gift item. Very pleased! I cook and bake a lot and always need clean spatula. This has solved the problem of opening the drawer over and over to get a clean spatula. 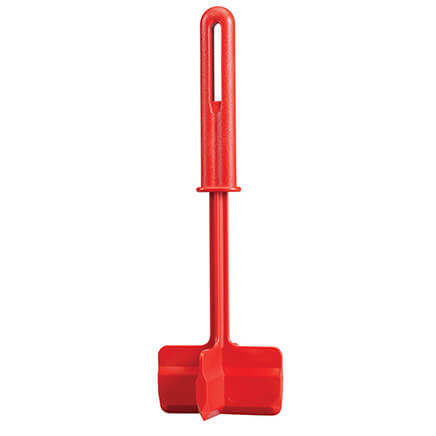 For me, this is a great time saver and holds my large collection of spatulas. The crocks were just as advertised, very nice product. I have only good things to say about the crocks. I use them on the counter tops next to the stoves in our vacation rentals. It's so much better than having them in a drawer as they used to be!! The one quart size is perfect and our business initials on them look quite professional. I looked for a long time in stores to find just the right crocks and finally found them in your catalog!! Thank you!! 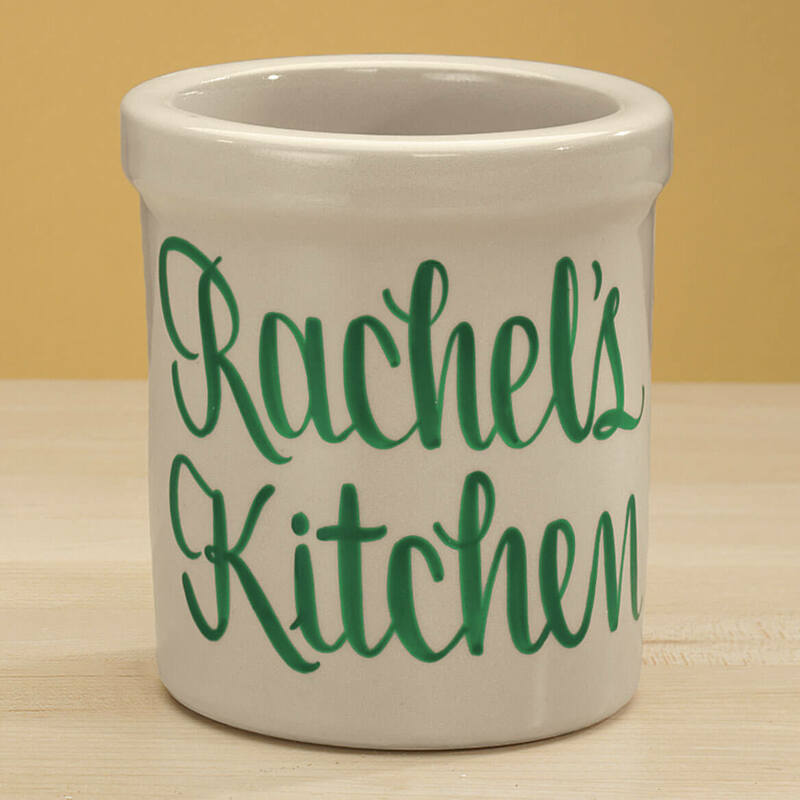 MY GRANDDAUGHTER WAS THRILLED TO RECEIVE AND DISPLAY THIS PERSONALIZED CROCK IN HER NEW KITCHEN. I have bought these for all the brides in my family, and all are still in use many years later. Very nice addition to my country kitchen. have bought both sizes for different items. I filled it with flowers when I gave it as a house-warming gift. Afterwords, she filled it with wooden utensils, whisks, etc. She loved that it also had her name on it. Purchase on for my neighbor for Christmas and she loved it, my doctor to retire in April I think she will love this for her kitchen and something to remember me. I choose this because it goes with my décor and I love the simplicity and the ability to personalize it to make it one of a kind. Everybody needs a place to stash utensils,pens,etc. It would look great in my kitchen. needed something to put utensils in. I wanted to have a place to put my kitchen items in a compact but pretty container to be on display. For the really special people in my life I like something personal. Who doesn't use tools in the kitchen. We all need a place to put them. My daughter saw mine and wanted one for christmas. Have 2 and love them! Love the way you can personalize it. These make nice gifts, I have bought several, shower gifts, Christmas gifts etc. I bought it before and loved it!!! Makes a house-warming present unique! have purchased several of these and great gifts, last for long time. I nred a crock for my utensils and I love this one! Its exactly what i need. I think it's very pretty and it will look great in my kitchen . I wanted different crocks for different utensils. So I ordered two with the name of utensils on each crock. To be honest, you cancelled my other choice, but this one is very nice and is sure to be useful and I'm thinking that Lisa can always use another utensil holder. I know that I can. You display it so nicely. It looks cool...I hope I like it! What are the crock's demensions? BEST ANSWER: Thank you for your question. 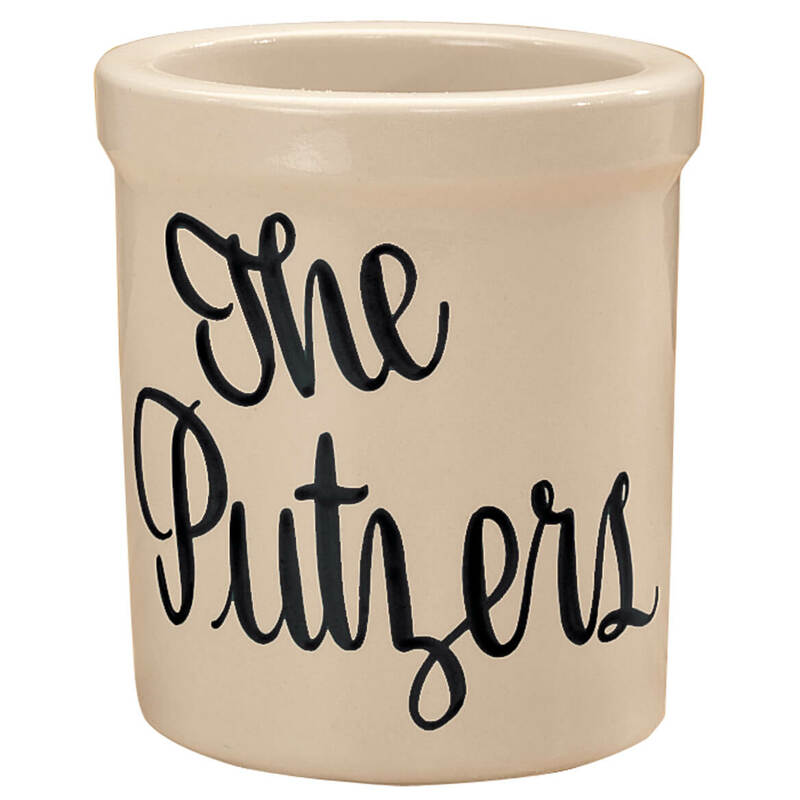 The 1 quart crock measures 5 1/2" tall, the inside diameter is 4 1/2" and the outside diameter is 5". 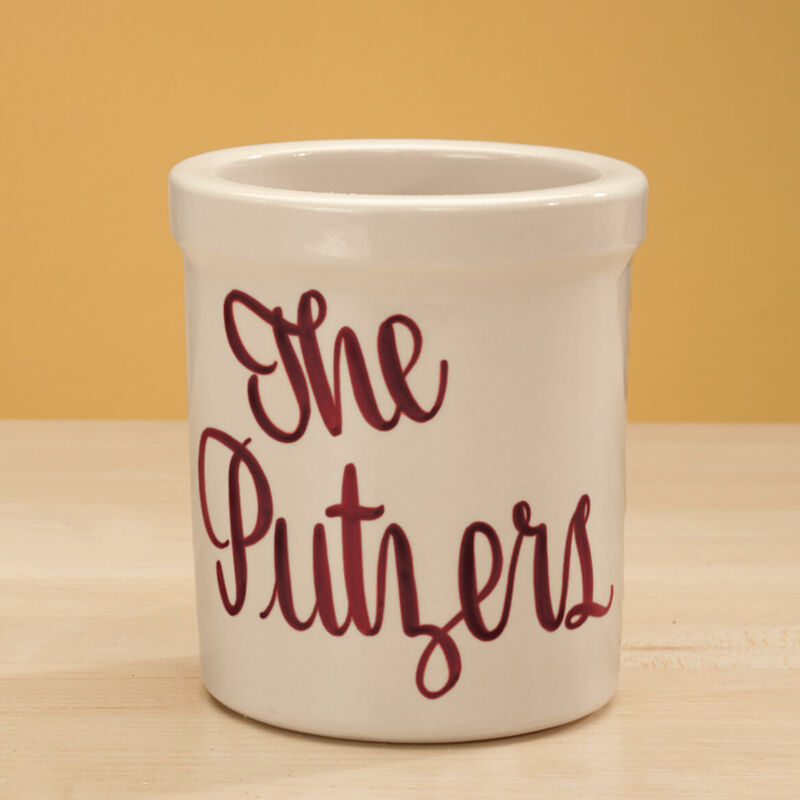 The 2 quart crock measures 6 3/4" tall, the inside diameter is 5 1/2" inside and 6" outside. We hope this information will be of help to you. How tall is the item? BEST ANSWER: It is 5.5 inches tall. we were looking for a crock for guest to sign at shower could they sign on this with a marker? BEST ANSWER: Thank you for your question. Permanent marker or permanent craft pens are recommended to be used. We do suggest that a finishing spray be used as the markers will wash off eventually with water. We hope this information will be of help to you. How high and wide is it ? BEST ANSWER: I gave it as a gift, but as I remember, it's about 4 x 6 or a little larger. The one quart should tell you about how large it is. Is the writing as shown in picture? When you go into screen to personalize, it shows a different writing. BEST ANSWER: The one I purchased had the personalization font from the personalization page- not the sample picture one. When you put in your personalization- that is what it should look like on the crock. BEST ANSWER: Thank you for your question. Yes, this item is offered with personalization. There is a box that says select; if you click on it, it will drop down and ask if you want the item plain or with personalization, click personalization and you will then be taken to the personalization fields at the bottom of the website. We hope this information will be of help to you.